with themes of love and loss, adventure and fate. 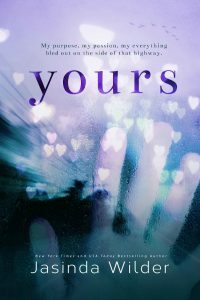 Jasinda Wilder delivers a heart-wrenching second chance romance that burrows deep into your heart and lingers long after you’re done. Yours is a story about loss and love, about grieving and healing, about freedom and adventure. The lives of the characters entwine in ways unforeseen, proving it’s never too late to alter the course of one’s life. In typical Jasinda Wilder fashion, she builds the story to where we quickly fall in love for its protagonists, feel what they feel, hurt when they hurt. And for Niall and Lachlan, although they’d lived very disparate lives, they had both felt the pang of heartache and loneliness, the breathless stun of surprise after their lives fell off course. Niall and her husband Oliver fell in love while part of the Doctors Without Borders program, saving lives in war-torn areas as bullets flew by them. Their love and their passion for helping others made it worthwhile, but fate interrupted their happy ever after when Oliver was killed in a tragic accident. Her plans for the future, her passion for her work, her happiness, her sense of self, all died along with him. She fell into a bottomless abyss of grief, paralyzed by the loss of him. We also meet Lachlan, who spent his years on open sea, traveling the globe without a care in the world, with many a woman to warm his bed. He wasn’t supposed to live past thirty, so he lived his life on the edge, daring destiny to take him. Any minute could be his last and so he lived it to the fullest. When time came for Lachlan, he relished living to thirty one, he’d beat the odds, but his heart had finally given out. He never expected to wake up in the hospital, after his death, with a new heart—a new lease on life. Lost without purpose, Lachlan embarks on a journey to find the family of the man whose heart gave him life, in hopes he’d find himself along the way. Lachlan and Niall meet, in a moment of happenstance. And when he realizes just who she is, his truth is muted by fear. Before too long, they’re healing each other. Finding new purpose together. Falling in love when both thought it impossible. Secrets and insecurities, however, threaten everything and Lachlan gambles on losing the very person who has shown him how to live. Lachlan and Niall’s romance is a storm of emotions. It’s messy and twisted and rife with heartache and fear. But I loved the threads which wove through their story: adventure, fate, love, courage and second chances. Fast-paced and heart-wrenching, Yours will hold your heart captive from its poignant beginning to its hopeful, happy end.